Now that we’re done saying how grateful we are for all the food with which we stuffed ourselves on Thanksgiving, and for our iPhones, and the gift of being able to drive one person per car to work every day…etc., I’d like to reflect on something we should really be thankful for: that we didn’t have a childhood that was more like a hard-working adulthood. And these boys didn’t get to drive to work listening to the car radio or an MP3 player. Lewis Hine was one of the greatest artists of the 20th century in my mind, because his art opened up people’s eyes to the massive abuse in child labor. Aside from the mid-1800s documentation of the Civil War (1860–1865), and some early documentation of squalor in American cities in the late 1800s, Lewis Hine was one of the first photographers to explore the idea of “documentary photography.” Perhaps because Hine, born in Oskosh, WI, lost his father at an early age, he developed an early empathy for people who experienced loss or hardship. At any rate, he studied sociology in college. After graduating from Columbia University in 1903, Hine began teaching botany and nature studies at the Ethical Culture School in New York. The school trained people to help serve the less fortunate and improve their lot in life through public service. In 1905 Hine’s boss gave him a camera as a teaching aid and to record school activities. His interest in social reform led almost immediately to his first documentary series in the same year. He set out to document the uncaring treatment of immigrants on Ellis Island. Those photographs were first published in 1908 in Charities and the Commons. In 1908 Hine quit teaching to become a photographer and investigator for the National Child Labor Committee. He felt that photography as social documentation was light that was required to illuminate the dark places of social existence. Between 1908 and 1916 he traveled widely, documenting child labor abuses. Hine called his photographs “photointerpretations,” because he felt that they were interpretive. Later scholars, however, consider them documentary. Between 1910 and 1912 Hine’s photographs featured the young boys (called “breaker boys”), usually between 8 and 12 years old, who worked in the coal mines of Pittston, PA. They worked—typically 13 days on and 1 off for $5 a week—breaking mined coal into relatively uniform sized pieces by hand and separating out impurities such as rock, slate, sulphur, clay and soil. 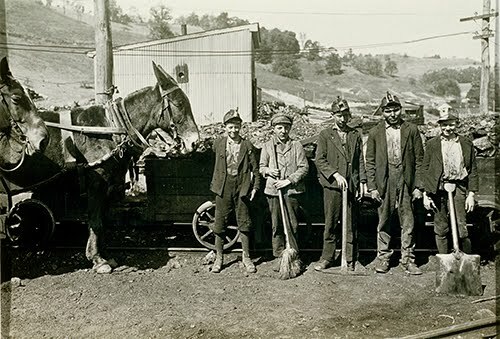 Breaker Boys often worked 14 to 16 hours a day. I wonder what they were thankful for on Thanksgiving? Or did they work on Thanksgiving? And, darn it, they couldn’t even listen to their MP3 player to break up the drudgery of their work day like so many of us do in offices.